** This activity is recommended for the elderly, shy/timid, strictly people pups and of coarse our canines who feel that they are just too good for play, and require lavish pampering. Our best seller. Includes three activities spaced through out the day. A walk in the morning after breakfast, followed by your choice of one of the following; play school or TLC session. A second walk is given after dinner before bed time to ensure sweet doggy dreams. 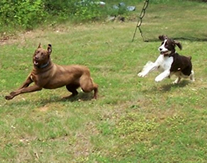 ** This activity is only recommended for the highly energetic, athletic, and young canines. Selections include ?Milo & Otis?, ?101 Dalmatians?, ?Homeward bound?, ? All Dogs Go To Heaven?, and other canine friendly flicks. All movies are rated Dog-G. Pupcorn and treats are included.